Want to use sitemap selector or file selector on a HTML block? Use this button if you'd like to insert a link of a page. 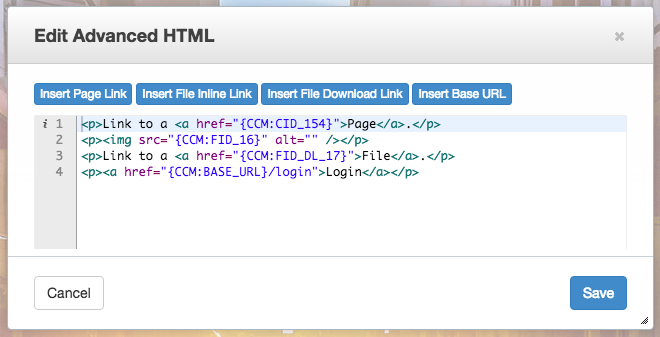 It inserts a placeholder like CCM:CID_123, this placeholder will replaced a link to a page when rendered the page. CID_123 means page id 123. Use this button if you'd like to insert a full path of a file. It inserts a placeholder like CCM:FID_123, this placeholder will replaced a download link of a file when rendered the page. FID_123 means file id 123. Use this button if you'd like to insert a download link of a file. Use this button if you'd like to insert an application url.